Ready to Learn about Hemp? When you need a complete source of protein, hempseeds deliver. They contain all 20 amino acids, including nine the human body is incapable of producing on its own. Just three tablespoons of hemp seeds provide 10 grams of protein, so while they’re great for any diet, hempseeds are particularly beneficial for vegetarians and vegans. They also provide minerals such as phosphorus, magnesium, zinc, and iron, as well as omega-3 and omega-6 fatty acids. As for flavor, think of a nuttier tasting sunflower seed. How to use it How you choose to use the mighty hempseed is only limited by your creativity. Sprinkle them over smoothie bowls, purée them into salad dressings, or even try kale-hemp pesto to toss with spaghetti. Meet your new favorite protein powder! With 14 grams of protein per scoop, it gives a plant-based power boost to your smoothie. 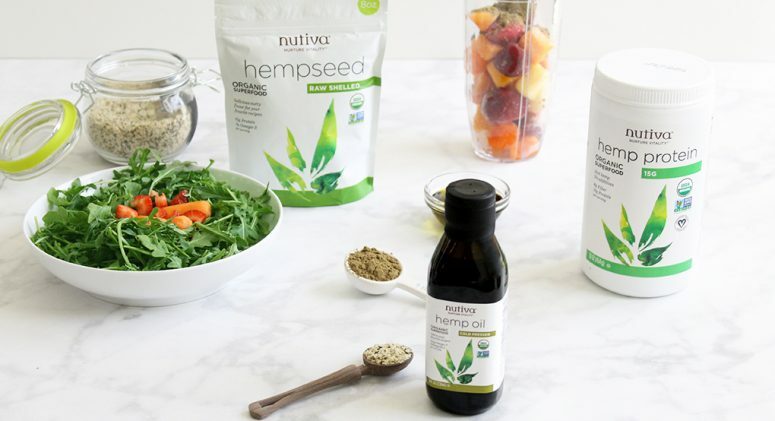 Nutiva hemp powders contain 66% edestin (an easily digestible protein)—more than any other plant!—plus 2 grams of essential fatty acids per serving. It’s gently cold processed without the use of hexane, a harsh chemical solvent often used to process non-organic soy protein powders. How to use it Transform your morning smoothie into a filling, easily transportable breakfast. You can also add a scoop to pancake batters or other baked goods like cookies or banana bread.